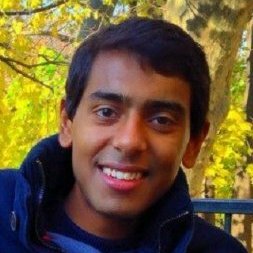 Does company size matter? In the upstart world of content marketing, the answer is a resounding “No!”… and nowhere is this fact truer than in the Asia-Pacific region. Content marketing is growing as an industry in APAC (by 5 percent to 10 percent annually, according to Campaign Live). And especially for mobile, marketers are shifting to content marketing and away from display advertising. In fact, Exchange Wire reports that display ad usage is expected to decrease on mobile by nearly 40 percent over the next five years, while content marketing on mobile will spike 48 percent, leveraged by almost half of content marketers in APAC. SMBs can’t achieve enough reach with their content marketing. SMB content has a much harder time becoming viral than content created by large businesses. SMB marketing messages have no chance of achieving global awareness. False, false, and false! For businesses, engagement with a message does not necessitate having a large company, a lot of revenue, or even a huge existing online presence. When it comes to the number of viral impressions that a Sponsored Content post generates in the Asia-Pacific region, SMBs are strongly represented. In fact, SMBs contribute 42 percent of the highest performing Sponsored Content posts with regard to that metric, more than any other company size. This is perhaps a result of them contributing over half of the highest performing Sponsored Content with regard to engagement rate. When LinkedIn members respond (through a like, share, or comment) to these Sponsored Content posts, their connections see the activity on their feed and are "impressed" as well (pun intended). And regarding global reach, these results do much to dispel the notion that large companies have a monopoly over the natural distribution of content. Small, mid-size, and large companies each contribute far-reaching sponsored content in nearly equal amounts. While small companies may not be able to compete with large ones using purse strings, they evidently still can use word-of-mouth to achieve global reach they may not expect. Thinking about the method used to obtain these numbers makes them even more striking. We collected all Sponsored Content released by APAC-based companies, large and small. And then we filtered that collection down to only the highest performing Sponsored Content (by engagement rate, number of viral impressions, and number of countries with significant viral exposure). After being fed the myths above, we might believe that SMBs make up a smaller percentage of these elite groups than they would of the overall population of Sponsored Content. This would mean they are weak enough to be “under-represented” when we focus in on the most successful Sponsored Content. 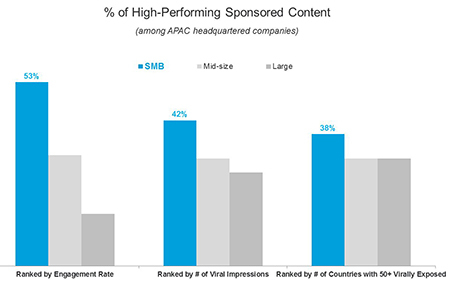 APAC SMBs are proportionally represented (not under-represented!) when filtered by viral impressions or global reach. APAC SMBs are actually over-represented on engagement rate (by more than 30%!). What’s that sound? Myths being busted. To finish off our reality check, let’s zoom in on the global presence that two small APAC-centered companies reached with Sponsored Content. Both had a modest presence on LinkedIn at the end of 2015: fewer than 5,000 followers, fewer than 200 employees… in short, representative of a typical, socially activated SMB on our platform. Here’s how a single Sponsored Content post from each of these companies fared globally, combining both sponsored and viral exposure by country. After starting strong in India and the US, our APAC-based B2C company found increasing interest in Asia (Australia, China, etc.) and the West (Canada, UK, etc.) as the weeks passed. The gif below illustrates how far the post spread. And its B2B counterpart may have intended a strong showing in Singapore and the Philippines, but must have been surprised to generate interest from Australia, the United States, and even Italy! The gif below shows how far the post's influence reached. Achieving international recognition and engagement means starting small, and the data backs up the notion that company size and existing reach need not matter while building up. Why? Because the mantra that any marketer must follow is to execute a high quality message through the right channels. Large companies are as much at the mercy of these words as small ones. For tips on crafting better sponsored content, consider checking out this presentation and also these expert tips. Marketers of small business… it is time to dream big! LinkedIn continues to work hard to provide its massively global network of professionals with content that helps them become more productive and successful. We look forward to continuing the discussion with you about how to get even more sophisticated about making content the “right stuff” for members. For SMB marketers and any other marketers looking to amplify their top performing content on LinkedIn, we're offering a $50 free credit on LinkedIn Sponsored Updates. This post was written in collaboration with Ben Russell. Special thanks to Yanni Kyriacos for his input. These analyses were conducted in February 2016 based on data collected between September 2015-February 2016. All aggregate numbers were performed on the top 1000 Sponsored Content posts by companies headquartered in the APAC region and ranked by the metrics explained in the post. The sample of Sponsored Content was filtered down to those with 15,000 impressions minimum, and with at least one engagement by a member. SMBs are defined as having <200 employees, whereas mid-size businesses have 201-10,000 employees, and large businesses have 10,001+. The results of this analysis represent the world as seen through the lens of LinkedIn data. As such, it is influenced by how members choose to use the site, which can vary based on professional, social, and regional culture, as well as overall site availability and accessibility. These variances were not accounted for in the analysis.